The Selex® high-precision, graded density cartridge filter is on the leading edge of depth filter technology. For critical filtration applications, the Selex delivers consistently high particulate rates that equal the performance of absolute rated filters. Selex filters also provide sharp cutoff efficiency ratings for demanding applications in the specialty coating areas and in process applications requiring classifying separation. 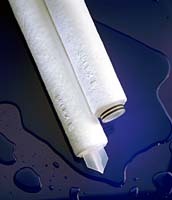 True graded density extends the life of the Selex filter well beyond other depth filter cartridges. When quality products require quality filtration, Selex is simply the best filter value. The absolute-rated Selex filter features the high particle-holding capacity and long service life associated with all Osmonics® depth filter products. From fine chemicals and electronics, to power plants and the oil patch, Selex delivers according to your specific application requirements. To create the new Selex high-precision depth filter, Osmonics started with the same patented manufacturing technology that gives HytrexÒ filters their exceptional dirt-holding capacity, clean performance and long life. Osmonics engineers developed an advanced fiber formation method with much reduced fiber size that enables us to manufacture an absolute-rated depth filter with higher efficiencies and sharp cutoff characteristics, while retaining high dirt-holding capacities. Osmonics manufactures the Selex filter using a patented process of extruding continuous polypropylene fibers, which bond to one another to form a rigid, self-supporting matrix. The Selex filter’s high particle selectivity is tightly controlled by varying the density and size of the extremely fine fibers. Controlled density and size of these fine fibers is also the key to the Selex filter’s superior dirt-holding capacity and longer life. The high structural strength of the Selex filter from one end to the other ensures filter integrity throughout its long lifetime. Larger, stronger fibers are interwoven and thermally fused together at the core. They will not deform under pressure or surges, and will not unload particles into the filtrate – even under demanding operating conditions. Self-supporting media require no separate center core. The fused core area’s inherent structural strength resists high pressure differentials. Continuous fiber intertwining prevents the layering often found in other cartridges. The thermally-bonded filter matrix prevents media migration and resulting fiber contamination of the filtrate. Patented continuous manufacturing process means consistent performance. Continuous process manufacturing with on-line testing assures reliable filter performance lot after lot. Pure 100% polypropylene means broad chemical compatibility. All materials are highest quality, lot controlled polypropylene. No wetting agents, solvents, anti-static agents, binders or additives of any kind are used in the manufacturing process. Cartridge incinerates to trace ash with no hazardous volatiles, for environmentally safe disposal.